August 31, 2005: C-17 Globemasters unload supplies at Keesler following Hurricane Katrina. A C-130J Super Hercules is cleaned up in the new wash system at Keesler. Keesler Air Force Base (IATA: BIX, ICAO: KBIX, FAA Location identifier: BIX) is a United States Air Force base located in Biloxi, a city in Harrison County, Mississippi, United States. The base is named in honor of aviator 2d Lt Samuel Reeves Keesler, Jr., a Mississippi native killed in France during the First World War. The base is home of Headquarters, Second Air Force (2 AF) and the 81st Training Wing (81 TW) of the Air Education and Training Command (AETC). The 81 TW is responsible for the technical training of airmen in select skill areas immediately following their completion of basic training as well as providing additional or recurrent training they will need for upcoming assignments. On average, Keesler has 4,700 students on base at a time. Much of the training they receive is in the field of electronics, such as wideband maintenance, ground radio, information technology, avionics, cryptography. The 81st Training Wing also trains personnel in the field of meteorology, to include observing, weather analysis and forecasting, radar operations, air traffic control, Aviation Resource Management (ARMS), and tropical cyclone forecasting. The 81st Medical Group is also located at the base and operates the second largest medical center in the Air Force. Other organizations assigned to Keesler AFB include the 45th Airlift Squadron (45 AS), a geographically separated unit (GSU) of the 314th Airlift Wing at Little Rock AFB, Arkansas. An AETC unit, the 45 AS provides flight crew training in the C-21 Learjet. The Air Force Reserve Command's 403d Wing (403 WG) is a tenant wing also located at Keesler and is an Air Mobility Command (AMC)-gained composite unit which provides theater airlift support through the 815th Airlift Squadron and its C-130 Hercules aircraft, as well as serving as the parent unit to the 53rd Weather Reconnaissance Squadron, a WC-130 unit known as the "Hurricane Hunters." Finally, Keesler is also home to CNATTU Keesler (Center for Naval Aviation Technical Training Unit), a training unit for Navy and Marine Corps enlisted personnel receiving training at Keesler, such as enlisted meteorology training, with their Air Force counterparts. Keesler AFB is one of the largest technical training wings in AETC, with four training squadrons located in the training building complex known as "the triangle," the 334th, 335th, 336th, and the 338th. In early January 1941, Biloxi city officials assembled a formal offer to invite the United States Army to build a base to support the World War II training buildup. The War Department activated Army Air Corps Station No. 8, Aviation Mechanics School, Biloxi, Mississippi, on 12 June 1941. On August 25, 1941, the base was dedicated as Keesler Army Airfield, in honor of 2d Lt Samuel Reeves Keesler, Jr., a Mississippi native and distinguished aerial observer, killed in action in France during the First World War. Congress initially appropriated $6 million for construction at Biloxi and an additional $2 million for equipment. By the time the War Department allocated the funds in April 1941, the projected cost had risen to $9.6 million. On 14 June 1941, the U.S. Army Corps of Engineers awarded contracts totaling $10 million to build Biloxi's technical training school. At the time, it was the most expensive government project to have been undertaken in the State of Mississippi. When the War Department activated Keesler Field in June 1941, not only was Keesler getting a technical training center, but it would getting one of the Army's newest replacement, or basic training centers. The first shipment of recruits arrived at Keesler Field on 21 August 1941. Many stayed at Keesler to become airplane and engine mechanics, while others transferred to aerial gunnery or aviation cadet schools. The Tuskegee Airmen were trained at Keesler. In fact, more than 7,000 Black soldiers were stationed at Keesler Field by the autumn of 1943. These soldiers included pre-aviation cadets, radio operators, aviation technicians, bombardiers, and aviation mechanics. Keesler continued to focus upon specialized training in B-24 maintenance until mid-1944. Thereafter, the base expanded its curricula to train mechanics for other aircraft. By September 1944, the number of recruits had dropped, but the workload remained constant, as Keesler personnel began processing veteran ground troops and combat crews who had returned from duty overseas for additional training and follow on assignments. Basic training wound down very drastically after the end of World War II, and it was finally discontinued at Keesler on 30 June 1946. In late May 1947, the Radar School arrived on Keesler making it responsible for operating the two largest military technical schools in the United States. Thereafter, shrinking budgets forced the base to reduce its operating costs: the Airplane and Engine Mechanics School and the Radar School were consolidated on 1 April 1948. In early 1949, the Radio Operations School transferred to Keesler from Scott Air Force Base, Illinois. In addition to training radio operators, Keesler was to begin teaching air traffic service technicians; aircraft approach controllers, ground radar mechanics, and radar repairman/ground controlled approach specialists. The last mechanics training courses had moved to Sheppard Air Force Base, Texas, by November. In early 1956, Keesler entered the missile age by opening a ground support training program for the Atlas missile. In 1958, all control tower operator, radio maintenance, and general radio operator courses came to be under Keesler's already broad technical training roof. During the early 1960s, Keesler lost many of its airborne training courses but Keesler still remained the largest training base throughout the 1970s. This included limited flight training operations in the T-28 Trojan for South Vietnamese Air Force (VNAF) student pilots. Keesler's student load dropped to an all-time low after the Vietnam War ended. As a result, Air Training Command inactivated the USAF School of Applied Aerospace Sciences on 1 April 1977 and replaced it with the 3300th Technical Training Wing, which activated the same day. During the early 1980s Keesler's air traffic control program garnered publicity - when the Professional Air Traffic Controllers Organization walked off the job in August 1981. When President Ronald Reagan fired the strikers, Keesler-trained military air traffic controllers were used to direct some of the nation's air traffic. As the air traffic control school it was also the logical location for the USAF Combat Controllers. Keesler AFB was the primary training base for many avionics maintenance career fields including Electronic Warfare, Navigational Aids, Computer Repair and Ground Radio Repair. 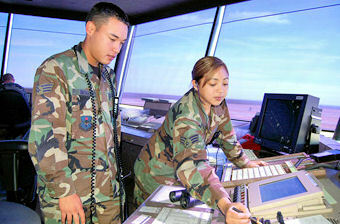 It was also the primary training base for most USAF administrative career fields. Driven by deep defense budget cuts, base closures following the end of the Cold War forced an end to technical training at Chanute Air Force Base, Illinois and Lowry Air Force Base, Colorado when those bases were closed by BRAC action. Keesler acquired Chanute's weather forecasting courses and Lowry's meteorology and precision measurement equipment laboratory training programs during 1992 and 1993. Massive restructuring of the Air Force in the early 1990s also meant several changes for Keesler associate units. The first occurred when the 53d Weather Reconnaissance Squadron was inactivated in the active duty Air Force, transferred to the Air Force Reserve and reactivated on 30 June 1991. Yet another major change occurred on 1 July 1993, when Keesler Training Center inactivated. At the same time Air Training Command (ATC) was redesignated the Air Education and Training Command (AETC) and the command reactivated Second Air Force (2nd AF) and stationed it at Keesler. 2nd AF's mission is to oversee all technical training conducted within AETC. There was also quite a bit of damage when Hurricane Camille passed over Biloxi in 1969. Most of the Back Bay housing area was under water. On August 29, 2005 Keesler sustained a direct hit from Hurricane Katrina, which made its third Gulf Coast landfall as a Category 3 storm approximately 30 miles (48 km) west. Although non-essential personnel and Hurricane Hunter planes had been evacuated in advance, "drastic damage" was sustained by the base's industrial and housing areas. Due to storm surge about 50% of the base came under water; the commissary, base exchange and some base housing units were flooded with more than six feet of water. By August 31, however, relief flights were landing at the base. On September 1 the first set of Airmen was evacuated to Sheppard AFB, TX. Other Airmen arrived the next day also to a welcoming session where they were given basic toiletry items and phone cards to call home. Wikimedia Commons has media related to Keesler Air Force Base.